"Sudden oak death is the name given to an epidemic, first detected in 1995, that affects three true oak species—coast live oak (Quercus agrifolia), California black oak (Q. kelloggii), and Shreve oak (Q. parvula var. shrevei)—and tanbark oak (Lithocarpus densiflorus). A previously undescribed pathogen, Phytophthora ramorum, has been identified as the infectious agent. Note that this updated publication replaces Sudden Oak Death in California." At this time, sudden oak death does not occur in Southern California. 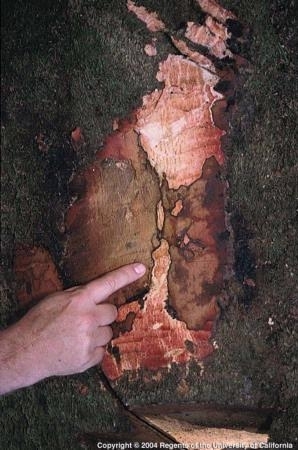 Phytophthora ramorum, the plant pathogen that causes the disease, can be spread by moving infested soil and plant materials; therefore, a quarantine is in effect for infested counties. Currently this disease is mostly a concern in forests and in the wildland-urban interface. To find out more about this disease and how to minimize its spread, please view Sudden Oak Death: Pest Notes for Home and Landscape. This resource is available as a downloadable PDF, or access as an HTML web page. Characteristics of infection by Phytophthora ramorum.